How many times in your life have you been able to walk up to someone — let's call them a friend, because they certainly won't call you one shortly after — and say, "Hey, I have a big bag of spiders!" Uttering such a statement may as well be a witch's curse or a banshee's wail because the entire room will immediately disperse. We know this from testing. Several times. While we don't recommend trying it for real, we suspect saying, "I have a big bag of spiders" would more effectively clear a room on fire than yelling out the accurate information. Experience power like no one except arachnologists with this bag of plastic spiders. 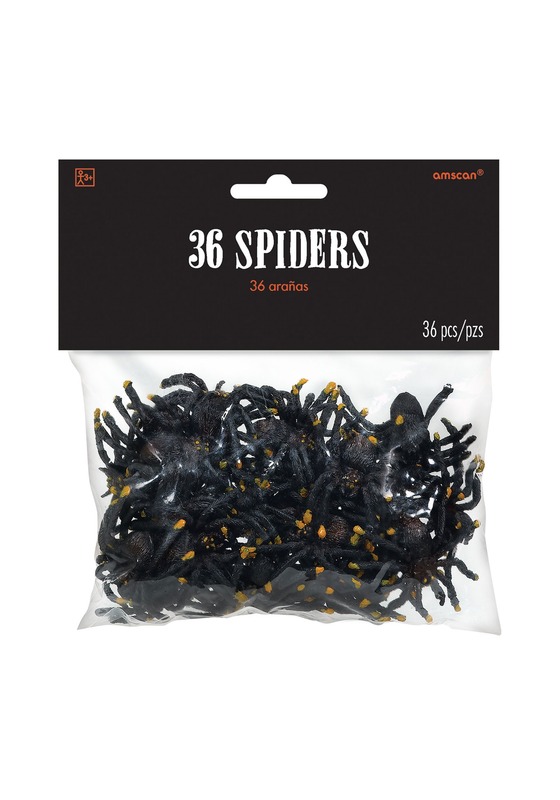 As promised, this is a bag of 36 plastic spiders, all of which have delightful black legs, adorable bodies, and gleaming orange fangs. You are not required to use all 36 of them at once or in one location, but you may find the effect is lessened if there are fewer than a dozen spiders involved in your decorations, pranks, or "gentle assistance in overcoming arachnophobia." They say that if you can see one spider, you can be certain that there are more. So, what happens if you see three dozen spiders!? Well, fortunately for the spider-phobic, spiders are actually pretty solitary critters, so that's not really true. But, that doesn't mean that this bag of spiders won't create more fun than 288 legs!